Please register to express your interest to attend this clinic. I can be booked to assess your horse and do the first two sessions on the same day. All consumables are included in the cost. Musculoskeletal Unwinding – $75 per hour this typically takes an hour. Cranio Decompression – $85, this is a flat fee. It will take as long as it takes. Some horses are relatively quick others take a while. Follow up sessions – $75 per hour. I do travel depending on the distance. A travel fee will be applicable. I have clinic weekends for groups of customers at a distance more than an hour’s drive away. A venue is identified, this can be the hosts property. All participants bring their horses to the venue. Day one is the musculoskeletal unwinding session. Some horses may need further deep tissue released as a priority this can be fitted into day 1. Day two is cranio decompression and for some horses further deep tissue release. 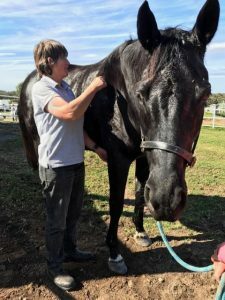 At a minimum, all horses have two sessions over the weekend and some will have three to maybe 4 depending on the horses needs and the owner’s priority. Travel cost is shared between the number of owners participating in the clinic. Again, owners are left with homework to continue the horses’ progress. During the weekend owners are kept informed on what I find on each individual horse and what I am doing to help the horse. All questions are answered to the best of my ability to assist in their education of what I do and how it works and why what I do works.